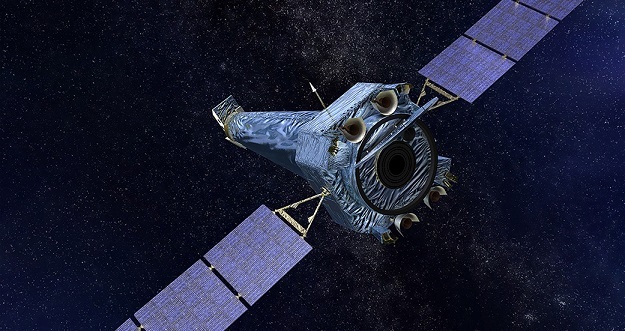 NASA’s Chandra X-ray Observatory entered into safe mode, according to a statement from the U.S. space agency. This comes about a week after another telescope—Hubble—entered into safe mode because of a gyroscope issue. According to an Oct. 12, 2018, press release, Chandra entered into safe mode at approximately 9:55 a.m. EDT (13:55 GMT) Oct. 10. This means the telescope’s scientific instruments were placed into a safe configuration while critical hardware was switched to backup units. Additionally the craft’s solar panels were pointed in a way to get maximum sunlight while the mirrors pointed away from the Sun. The telescope orbits Earth every 64 hours, 18 minutes at an altitude as high as 86,500 miles (139,000 kilometers) and as low as about 9,900 miles (16,000 kilometers) to detect to detect X-ray emissions from areas of the universe such as exploded stars, clusters of galaxies and matter around black holes, according to NASA. Chandra is composed of three parts: the X-ray telescope, the science instruments and the spacecraft. The telescope has four pairs of nested mirrors that focus the rays for scientific instruments to produce images that can then be analyzed. The spacecraft part of the vehicle includes batteries, thrusters, gyroscopes and solar panels. Another NASA observatory is also experiencing issues. The 28-year-old Hubble Space Telescope went into safe mode Oct. 5 because of a failed gyroscope and teams at the U.S. space agency are working to diagnose the problem. According to NASA on Oct. 12, the Hubble operations team turned on a backup gyroscope, but that one did not perform as expected, reporting rotation rates “orders of magnitude higher than they actually are.” More tests showed the backup device was properly tracking Hubble’s movement, but the reported rates were consistently higher than actual rates. “This is similar to a speedometer on your car continuously showing that your speed is 100 miles per hour faster than it actually is; it properly shows when your car speeds up or slows down, and by how much, but the actual speed is inaccurate,” a NASA said. NASA said if the Hubble team is successful in solving the problem with the backup gyroscope, the telescope can return to its normal, three-gyroscope operations. “If it is not, the spacecraft will be configured for one-gyro operations, which will still provide excellent science well into the 2020s, enabling it to work alongside the James Webb Space Telescope and continue groundbreaking science,” the U.S. space agency said.